This best-in-breed affordable surge protector continues to let power flow even after protection is exhausted. 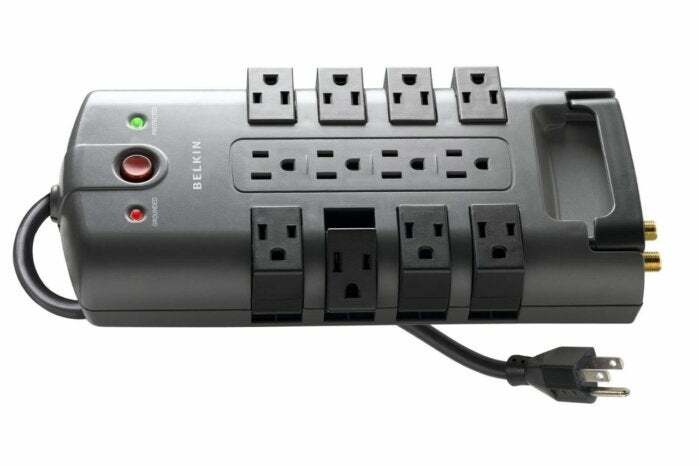 If you have equipment that could lose data or be damaged if powered down abruptly, including a desktop computer with a hard disk drive (HDD) rather than an SSD, Belkin’s 12-outlet PivotPlug (model number BP112230-08) is the right choice. Its $33 price tag makes it one of the more expensive surge suppressors we’ve evaluated lately, but it’s also the most flexible and it has the highest joules rating (4320) and the lowest clamping voltage (330 volts on all legs). More clamping requires adding MOVs (metal-oxide varistors) to increase joules, because it’s more likely surges will eat away at the protection when the voltage threshold is lower, and this model lists durability in joules at 40 to 50 percent higher than its two closest competitors that we've reviewed to date. The PivotPlug has four standard-spaced outlets down the middle, and then four pivoting sockets on either side with outlets oriented so that the ground plug points outward. These side sockets pivot up to 90 degrees, letting you often intermingle ungainly AC adapters to fit all of them in. I found one extra-wide USB charger that didn’t play well with the pivots and blocked one outlet, but it’s an outlier. Belkin's model number BP112230-08 surge suppressor has a handy cable organizer. Belkin’s surge protector includes both Protected and Grounded indicator lights. You’ll need to watch the Protected light to see if it goes out after a storm or other power issues you’re aware of, and flip the power switch off when that happens, which could be after years of use. If the Grounded light doesn’t light up when you plug it in, contact an electrician immediately. This unit lacks a circuit breaker/reset button combo, unlike some competitors, so it’s relying entirely on MOVs to protect equipment. One nice touch is a cable organizer that unsnaps so you can feed cords through it and then click it back into place. 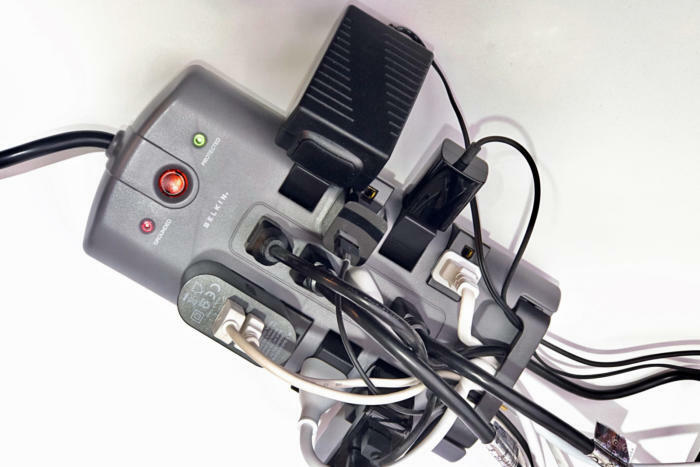 This can reduce tangle, especially if you’re mounting it on a wall or the underside or back of a desk. Belkin also offers the highest value damaged-equipment warranty protection: $300,000, although as noted in our overview, it can be hard to collect, and most people aren’t attaching more than a few thousand dollars of gear anyway. The PivotPlug also includes coaxial and telephone line pass-through protection, which we find isn’t valuable or reliable on any model. We didn’t test these and don’t recommend using them. Twelve outlets, eight of which pivot, plus a low clamping threshold, high durability measured in joules, and a cable organizer combine to make this a great surge protector at a reasonable price. The only reason not to buy the PivotPlug is if you want power to stop flowing when protection ends, rather than keeping an eye on the Protected light.